Every once in awhile I cheat on my dearly beloved peanut butter with sunflower seed butter. I am drawn to it’s uniquely powerful and slightly sweet flavor. I had an open jar of Trader Joe’s sunflower seed butter and knew that if I didn’t make something with it, my spoon would just find it’s way into the jar, over and over, until it was gone. And I wanted to create something with it rather than just inhale it from the back of a spoon. I almost made cookies with it but that was feeling a little on the uninspired side, and rather than turning on my oven, I simply turned on my food processor and made these granola bars. They almost taste like cookies but not a drop of butter or a granule of refined sugar was used. Thank you very much, sunflower seed butter. To make the bars, I add a few handfuls of pitted Medjool dates, whole-rolled oats, sunflower seed butter, agave, cinnamon, and vanilla to the canister of my food processor and blended. About 37 seconds later, I had a big blob of oatey-sunflowery dough that was slapping around the perimeter of the canister like a shoe slaps around in the dryer. Running shoes and puddles don’t mix, thus the dryer. A well-formed dough ball that bangs around in the food processor is a good sign when making no-bake bars because it indicates the mixture is moist and dense enough to stick together. This translates to bars that will hold their shape when sliced. A mixture that’s too dry and crumbly can’t be formed into bars that will stay together and conversely, a mixture that’s too wet is like trying to turn nut butter soup into nut butter granola bars. However, I purposely kept the mixture just a smidgeon on the wet side because I planned to stir in a cup of crispy rice cereal by hand, and knew that it would soak up a bit of extra moisture. After removing the dough ball from the food processor, I placed it in a large mixing bowl, and stirred in the crispy rice cereal, almost stabbing and poking the cereal into the sunflower seed butter-date-oat wad, crushing the cereal a bit with the spoon. As the cereal breaks down, the resulting dust acts as a flour-like binder, and helps to solidify the dough by soaking up some moisture. 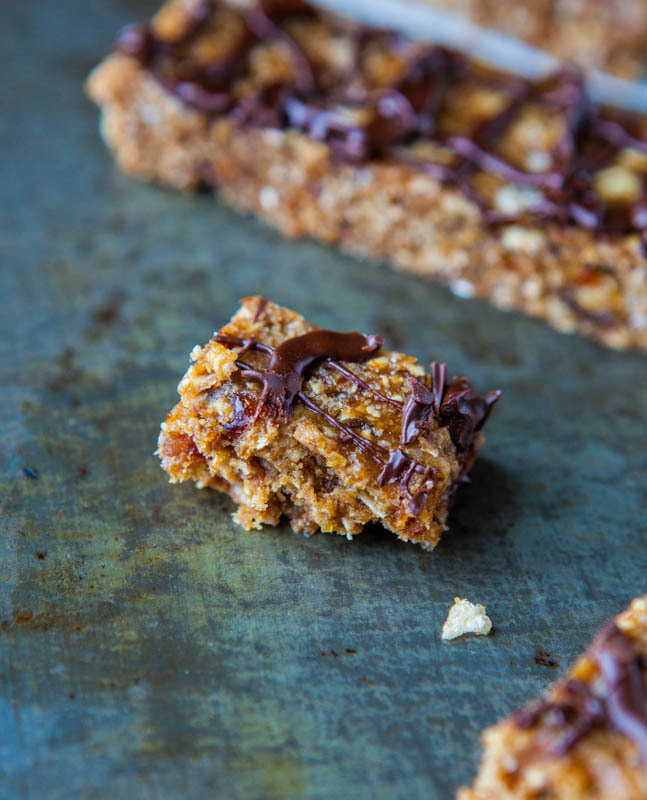 The amount of texture the granola bars gain from the modest amount of crispy cereal used, just one cup for the whole batch of bars, is quite astounding. 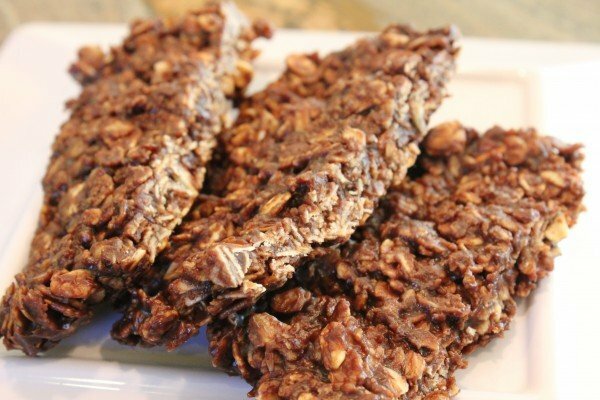 I realized this by way of a happy accident when I happened to toss a few handfuls of cereal into the Peanut Butter Chocolate Chip Granola Bars (no-bake) and now I’m hooked on the results. The airy, crunchy, snap-crackle-pop effect adds a prefect crunchy surprise effect in each bite. No bar is complete without chocolate. Well, not for me. I could have put chocolate chips into the food processor or hand-stirred some chopped chocolate chunks into the doughy batter, but instead melted one-half cup chocolate chips and drizzled the shimmery sauce over the bars. The nice thing about drizzles is that it feels like I get a lot of bang for my buck. Visually, it’s more impressive than blending it into the batter, where it becomes a bit lost. Plus, when chocolate chips are blended in, their flavor doesn’t seem to pop as much compared to being drizzled. We all eat first with our eyes. And seeing the chocolate drizzled prominently on top allows me maximum savoring quotient with each chomp. 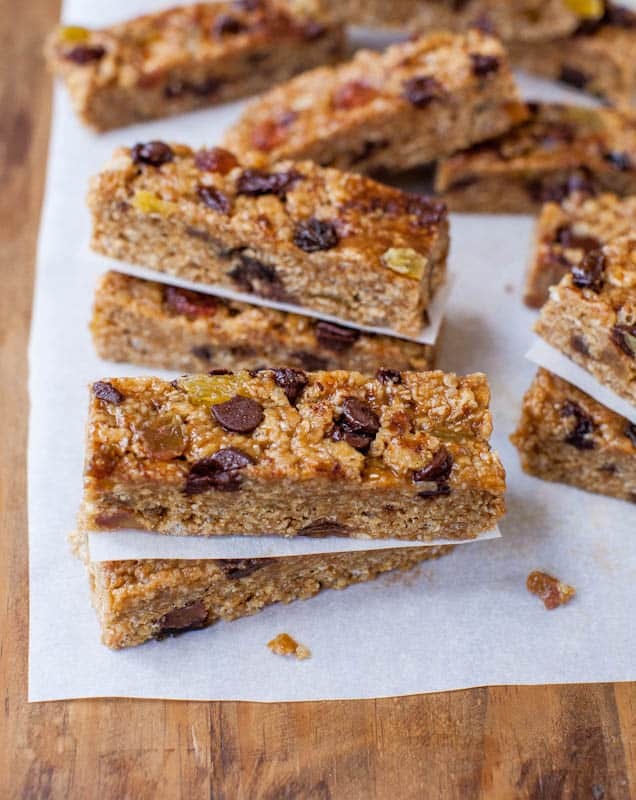 There’s a lot going on with these bars, for something that takes just ten minutes to make and is vegan and gluten-free. 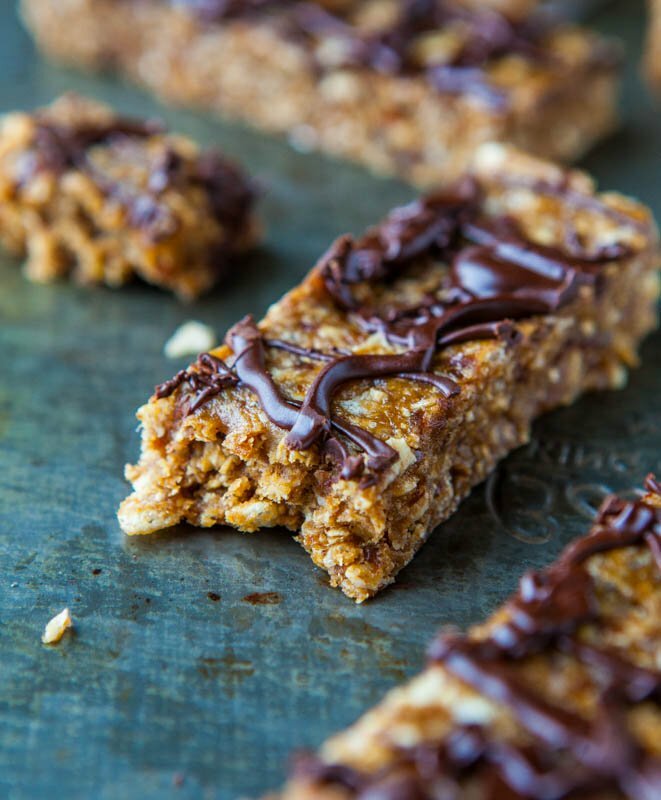 There’s the lightly salty yet delicately sweetened sunflower seed butter, the chewy and hearty oats, the crispy cereal bits and pieces that are mixed in, the gooey ‘n chewy Medjool dates, which really are nature’s candy; and it’s all adorned with a melted semi-sweet chocolate drizzle. Notes of cinnamon and vanilla complement the sunflower seed butter and dates, and I added a touch of agave to both help moisten the mixture when blending it and to lend a subtle sweetness to the finished bars. Brown rice syrup, corn syrup, maple syrup, or honey may be substituted but I prefer the clean sweetness of agave in no-bake bars or little no-bake cookie dough balls, because it allows the other flavors to shine through loud and clear as opposed to say, maple syrup, which would mask certain flavors. So this granola bar project was better than eating sunflower seed butter straight out of the jar. Well, it at least slowed down the spoon-directly-into-jar situation. These granola bars are made with one of my favorite nut butters, sunflower seed butter. It has a distinctively bold, yet slightly sweet flavor. 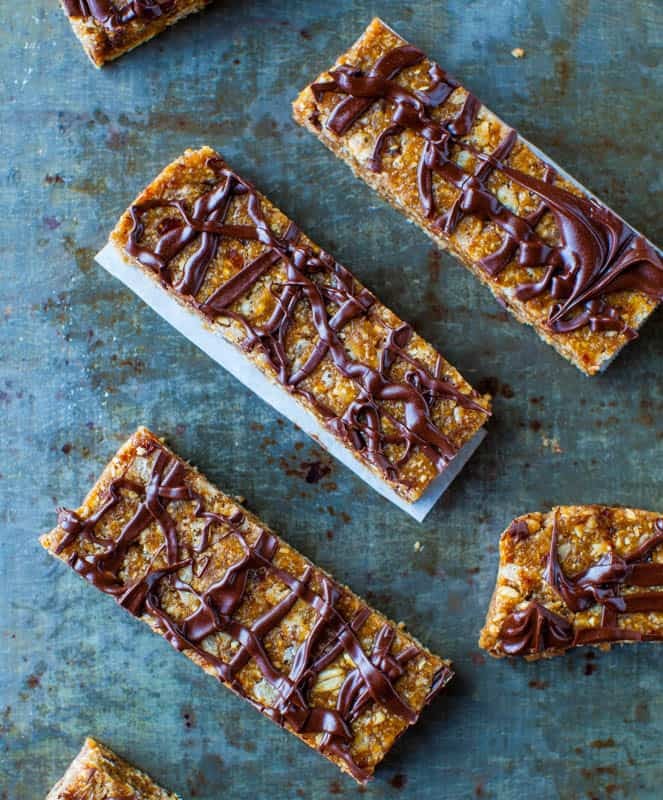 By combining sunflower seed butter, agave, and Medjool dates with oats in a food processor, these no-bake granola bars come together in minutes and are finished off with a chocolate drizzle. They're vegan, gluten-free, fast and easy, very chewy and texture-filled. Perfect to toss into a lunch box, gym bag, or purse. Line an 8-by-8-inch pan with aluminum foil and optionally spray with cooking spray; set aside. To the canister of a food processor or Vita-Mix (I used a food processor) add oats, dates, sunflower seed butter (I used Trader Joe's), agave, cinnamon, vanilla, and process until mixture comes together. Mixture will be dense and should form a big dough ball in the food processor; this is a good sign. The mixture should err on the side of being wet because 1 cup cereal will be stirred in by hand in the next step, absorbing some of the moisture. When squeezed between fingers, the mixture should hold it’s shape, not fall apart, nor be crumbly at all. If it crumbles or falls apart, it’s too dry and needs more moisture or a binding ingredient such as additional agave, sunflower seed butter, or dates to be added in order for it to come together. Conversely, add more oats if mixture seems very sloppy or wet, noting that 1 cup cereal will be stirred in next, absorbing some moisture. This is not an exact science and you may need to play with the ratios of wet and dry ingredients, but the goal is a mixture that can be packed into a pan, and when sliced, will hold it’s shape in bar form; it should be thick, moist, and dense. Transfer mixture to a large mixing bowl and stir in the crispy rice cereal, slightly crushing it while folding it in with the spoon. Keep folding until all the cereal appears to disappear into the mixture. Firmly press mixture into an even flat layer in prepared pan and smooth it with a spatula; set pan aside. In a medium microwave-safe bowl, melt the chocolate chips on high power, about 1 minute. Stir until chips are melted and smooth, reheating in 10 to 15-second bursts until chocolate can be stirred smooth. Drizzle chocolate over the dough and place pan in the refrigerator to set up for at least 30 minutes before slicing and serving. Bars may be wrapped individually in plasticwrap or stored in an airtight container and kept at room temperature for up to 1 week, or stored in the refrigerator for up to 1 month, or can be frozen for up to 3 months. Take care to use brands of ingredients that are certified gluten-free or vegan, if your dietary path necessitates it. Have you tried or do you like sunflower seed butter? If you’ve never tried sunflower seed butter, I’m not sure how to accurately describe it – how do you describe what a strawberry tastes like to someone who’s never had one – same conundrum. Ironically, I don’t think sunflower seed butter tastes much like sunflower seeds. The flavor is distinctive, robust, and bold, much in the way that peanut butter is. When added to something, you know it’s there. And no, sunflower seed butter and peanut butter taste nothing alike; nor does sunflower seed butter taste like almond butter, which I consider much more demure and plain and am generally bored by it. Sunflower seed butter can be a bit on the runny side, similar to almond butter, and can separate a bit and therefore needs a good stir before using it as to not end up with a clay-like lump at the bottom of the jar. It’s recommended to store it in the refrigerator after opening it, or so they say; sometimes I do and sometimes I don’t. I buy the Trader Joe’s brand because it’s $3.99 for a jar and I love it. There are other brands, MaraNatha and Sunbutter for example, which are sold at natural food grocery stores, but they’re usually more expensive and since I love the Trader Joe’s version and it’s cheaper and I’m going there anyway, I stick with it. However, I need to make my own homemade sunflower seed butter. I’ve blended in some sunflower seeds with peanuts when I’ve made Homemade Peanut Butter, but have never made solely sunflower seed butter. Feel free to link up any favorite recipes using sunflower seed butter. 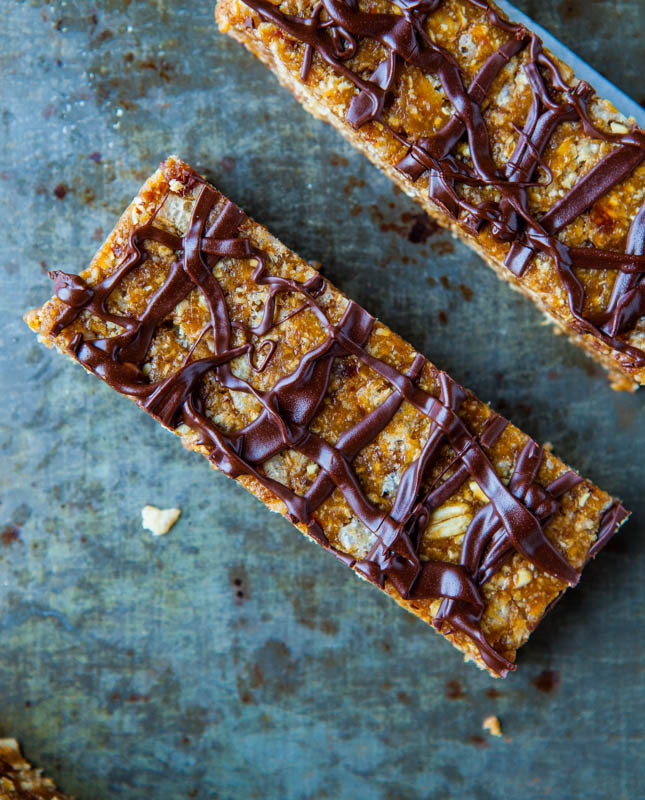 These bars look great, and it gets that sunflower seed butter away from your spoon. Thanks for sharing it. Made these today as soon as i saw them. I’ve never seen sunflower seed butter here in germany, so i used up the jar of peanut butter i had and i used honey instead of agave. They. Are. AMAZING! My mom told me to never stop making them, they came out perfect! Thank you so much for the recipe! I am a sunflower seed butter newbie, and all I can say is that I’m hooked! I bought Trader Joe’s and it is so fabulous. I planned on using that jar to make this recipe, but I had to buy some more. :-) I made this recipe today and it tastes so awesome. I’m always trying to cut down on sugar, so I only added 10 dates and 1/2 of the agave. Well, I’m sure you can guess what happened, right, I had to add more. The batter was way too dry. I added 5 more dates and a little more sunflower seed butter. I really don’t like anything too sweet. The batter was stiffer and held together, but I had to mix the cereal in by hand. I got a workout. :-) These are great. I hope I can pace myself and not eat them all at once. 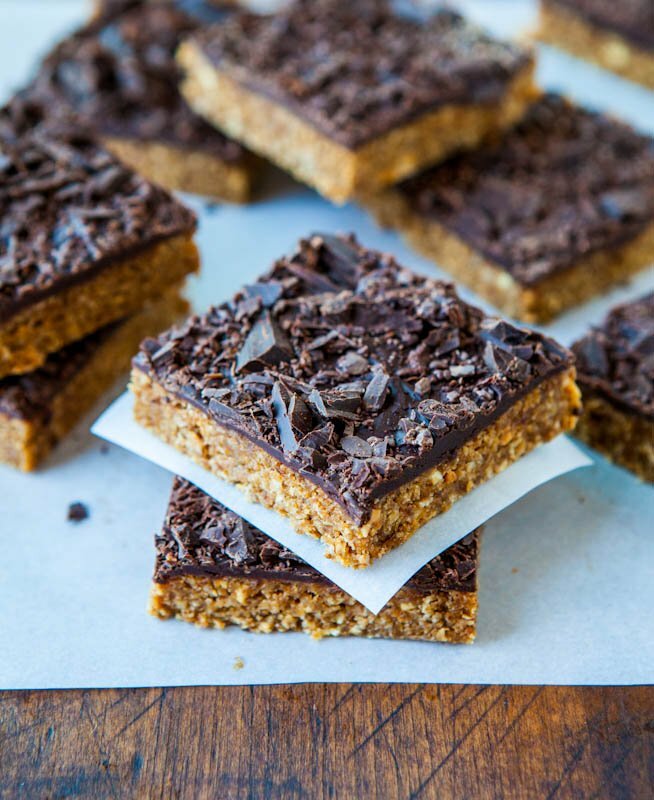 They are better than any bar out there with all of their processed ingredients. Thanks for another great recipe!!! Glad you’re a fan of SFSB and are putting it to good use in these bars. I love them and also the PB Granola Bars linked in the post are excellent – my fave granola bars ever. Not ‘low in sugar’ per se, but at least you know EXACTLY what’s in them, whereas with storebought, you never really do. LMK if you try other recipes! 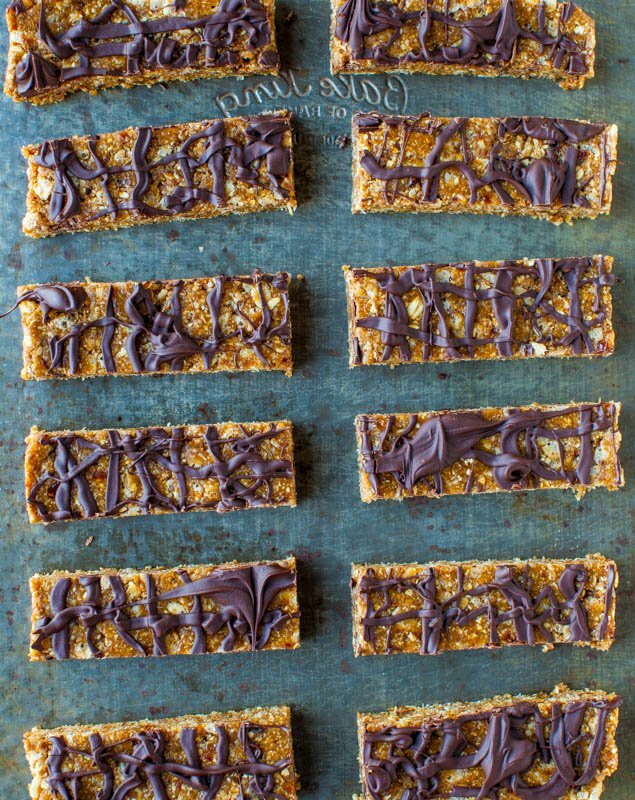 Hi Averie- I definitely need to make these and some of your other granola bars STAT. I have two recipes on my blog that involve sunflower seed butter: one is for Homemade Sunflower Seed Butter (so easy to make!) 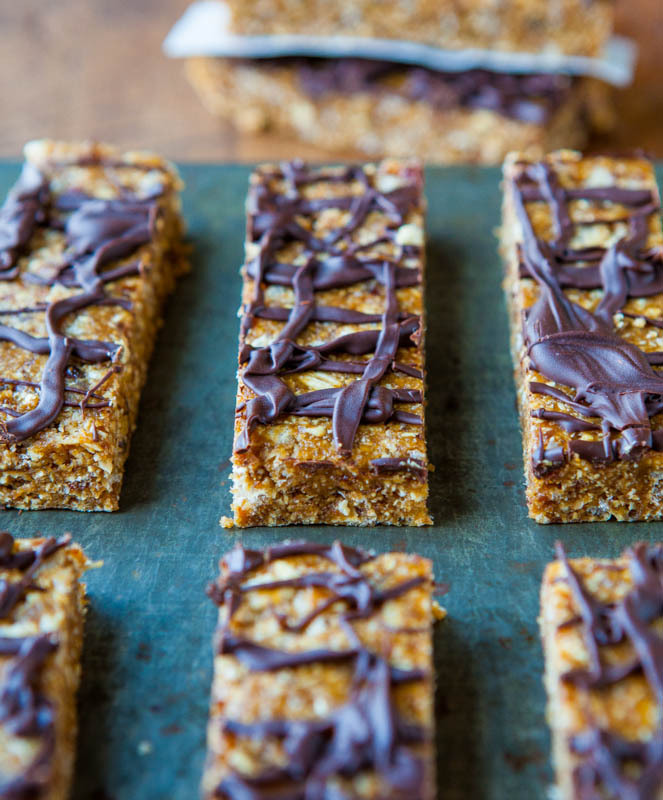 and the other is for some really delicious Crunchy Sun Butter Granola Bars with Hemp Hearts. Let me know if you ever try them and what you think! Love your blog! Thanks for stopping by Katie and I love making homemade PB and other butters and spreads, too! Great looking recipes! I’m not a big date fan any substation ideas? Would any dried fruit work? These sound delicious. The flavor of the dates really isn’t strong and is covered up by everything else. You could possibly use raisins. You need a thick, paste-like fruit. I think you should make the recipe as written and I assure you, you won’t think to yourself, oh wow these taste like dates. At all. I have , what could be, a silly question. 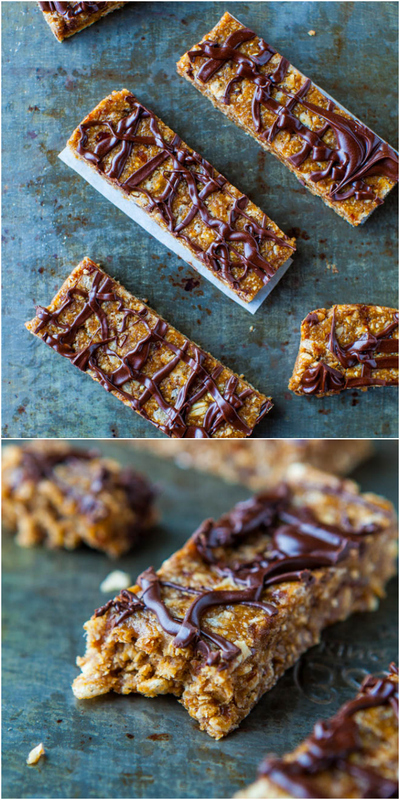 Instead of using rice Krispy cereal, is it possible to use actual brown rice in these bars? I know it probably wouldn’t be AS crispy but brown rice never gets mushy (unless I’m making it wrong). It always seems a bit tough to me and would be healthier than using processed cereal. Your thoughts? Hmm, I am not really sure about it. My first response is NO that would be gloppy and gross but the more I think about it, it *could* work. You never know til you try! I love the flavor of these and after making them twice thought I’d share a method that worked better for me as I don’t have a Vitamix. Start by pulsing the oats in a food processor a couple times to chop them up a bit, but you don’t want much powder so don’t overdo it. Then I’d definitely warm the sunbutter up a little. While that’s heating, make a paste with just the pitted dates in the food processor (you still want it to ball up; this may take a couple minutes; if you can’t get them to that point because they’re old and dry you may just need to use them minced and add some extra honey or sunbutter in the next step). Then combine all that and everything else in a stand mixer, mixing on low and scraping the sides down till incorporated. Lovely flavor and great healthy snack with staying power.